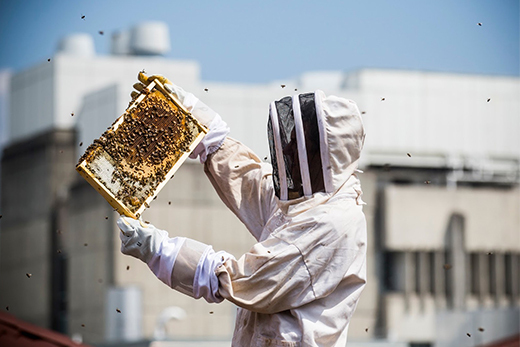 "The fate of bees will affect people very viscerally," says Berry Brosi, shown tending his hive on the roof of Emory's Math and Science Center. President Obama recently launched perhaps the most ambitious national plan ever aimed at protecting insects. The National Strategy to Promote the Health of Honeybees and Other Pollinators calls for an “all hands on deck” approach to slow their alarming declines. “Pollinators are critical to our nation’s economy, food security and environmental health,” notes the plan, prepared by the White House Pollinator Health Task Force. Bees are important to more than just food crops, he adds. Cotton plants, for example, need pollination to produce the fibers that are a cornerstone of the garment industry.